Tom Szulist from Singer Farms Naturals. 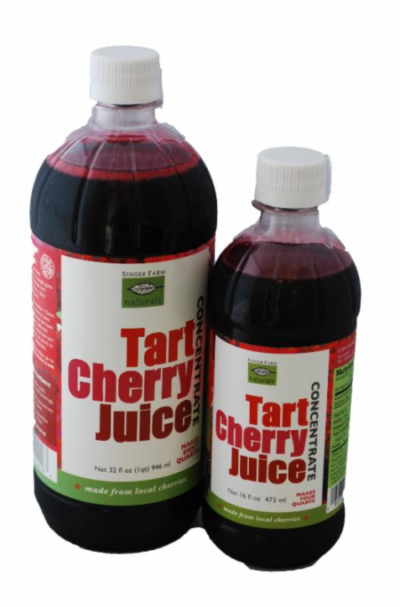 Tart Cherry juice offers many health benefits…improving joint function, cardiovascular health, and immunity boosting. The bright-colored skin of a tart cherry contains Anthocyanins. These phytonutrients are found to be beneficial for many inflammatory-related conditions including arthritis. Studies have shown that tart cherry consumption lowers uric acid levels which helps to relieve gout. 20-25 pounds of Montmorency cherries are used to make one 32 oz. bottle of concentrate. One ounce of concentrate equals one serving. You can mix the concentrate with water or other favorite beverages. This weekend we are offering 10% off Singer Farm Naturals Tart Cherry Juice Concentrate (16oz & 32oz).